Last week, I shared the story of our little Madden's birth and my C-section. But my doula sent over this story she wrote, so I really wanted to share this as well! At a routine ultrasound on January 16th, about a month ahead of baby’s due date, Shannon and Dan learned that baby had tucked himself into a cozy Frank breach position which meant that either baby would need to flip or they would need to consider different options to ensure a healthy, happy delivery. Thus began a series of treatments meant to encourage baby Madden to flip. Shannon began weekly appointments with an acupuncturist and a chiropractor, she did flips in the pool, lay upside-down on an ironing board every night, and even tried moxibustion. 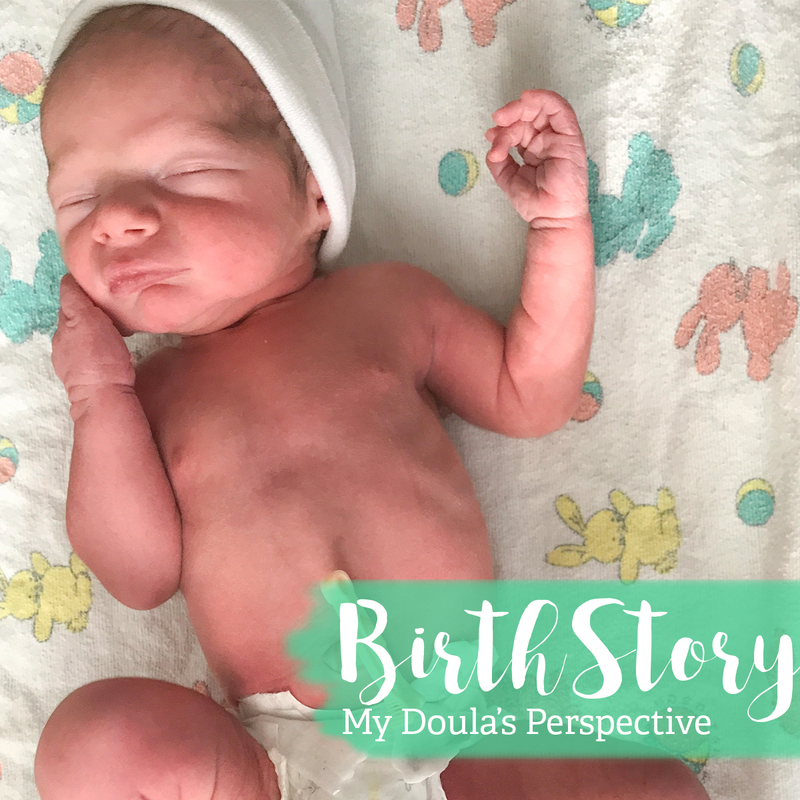 After a failed attempt to “sift” baby with their doula and a version at the hospital (where baby barely budged) it was clear it was time to look at the other options and prepare for baby to come in a different way than they’d expected. Both Shannon and Dan trusted that if baby Madden wasn’t flipping, he probably had a good reason not to. A date was set for a scheduled cesarean, Shannon and Solveig formulated a new birth plan, and their family took the next week to adjust to the change. Mom had her last days of work and had some well-deserved pampering, the family took their last little outing as a family of four, and mom and dad even snuck in a date night. Throughout the last few weeks mom had started to feel the stronger Braxton Hicks contractions, which they knew were a sure sign that baby was getting ready. On February 10th, exactly one week prior to baby’s official due date, mom and dad met their doula at the hospital at 8:30 am (not before they snuck in one more good workout). They sat through registration and were lead into triage where they met with Dr. Eve and the anesthesiologist to go over the plan and what to expect. It was a quiet morning in the hospital so after one last ultrasound, at 10:00 am, to make sure baby was still snuggled in his breach position, they were moved to their pre-op room where they dropped off bags and sent out last minute texts updating family on baby’s timeline. At 10:30 am, just as Dan and Solveig were getting into their sterile outfits, nurse Shirley came to walk mom back into the operating room. It was officially time! They were so lucky to have such an incredible team supporting them through this process that held so many unknowns; Shirley stayed with mom as a warm, calming presence, while Randy administered the spinal, explaining everything he was doing step-by-step. Shannon lay down and as the drape went up and her belly was being prepped, Randy put the James Morrison playlist on and Dan and Solveig were led into the operating room. It was a sweet scene, with dad close to mom’s head, holding her hand, and doula nearby encouraging mom while this amazing team worked to bring Madden safely into the world. Mom was so steady and calm, still herself in the midst of all of it. She stayed strong and alert, asking questions as they went and breathing through the strange pain and pressure she was experiencing. Dad was Shannon’s rock, staying as close to her as he could; they shared a few very special moments of gratitude, knowing they’d be meeting their son so soon. Baby Madden was born at 10:59 am, beautiful and healthy, and let out the sweetest little cry just to announce he’d finally made it. After a quick check (he arrived with perfect apgar scores) Madden was placed on his mama’s chest where he stayed, curled up, quiet, and perfectly content, until it was time to head back into their room. With this tiny little hand wrapped around Shannon’s finger, mom and dad looked at each other in awe. Shannon had been a fiercely brave, and strong mama through an intense birth that was not what they had anticipated and now they were officially the lucky parents to three beautiful, healthy children. Back in the pre-op room, around noon, they texted their families to give them the good news. Dan was able to hold Madden while Shannon was checked and pain medicine was administered. Despite some serious pain, and the adjustment to a recovery that would be totally different from the ones she’d experienced in the past, she remained centered and optimistic. In that first hour and a half in the pre-op room mom and baby sweetly navigated their first feeding --Madden latched right away, just as calm and content as he’d been from the moment he was born. By 2:00 pm they’d settled into their recovery room and were eagerly anticipating the arrival of Brooklyn & Jameson, and the rest of their families.